With the retirement of Magical Farms we had an opportunity to purchase interest in this amazing male. We have one of his sons who has won 18 Championships to date. Why would we want Black Midnight too? Our Captain Midnight is from one of our favorite bloodlines. We have several females who are related to Captain, but not to Black Midnight. Do we want more Captain Midnights? You bet!!!! Call us to book your breeding to Black Midnight. On September 6th Colonel Midnight arrived. He's the full brother to our 18X banner winning 5C's Captain Midnight. This beautiful TB male is just as exciting as his award winning brother. So exciting that we plan to repeat the breeding for a 3rd time. Male or female, this combination just seems to be a real winner. See the description more accolades of Black Midnight below. 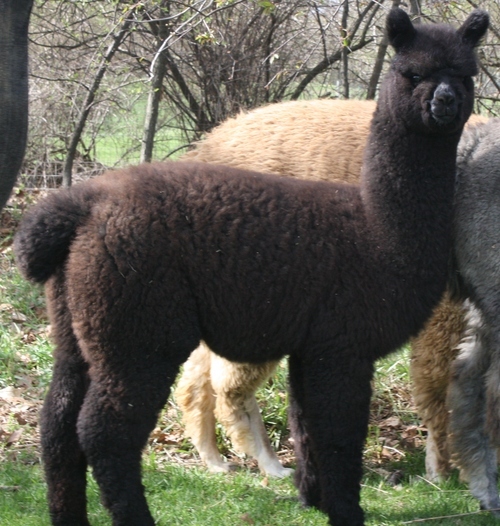 With a pedigree that could knock off anyone's socks, LMFI Peruvian Black Midnight has the fleece to match! His dam is Libby Forstner's famous 16-time champion black female champion LMFI Peruvian Black Pearl. His sire is MFI Peruvian Jericho, sire of the famous Majestic Peruvian Jeremiah. Jericho's offspring have won over 420 ribbons and over 120 championships and Jeremiah is just one of them. Our 3Dr Black Magic has been bred to Gabriel Star of Robasia. With Black Magic lineage line of Dom Timbo and Gabe's lineage of Snowmass. 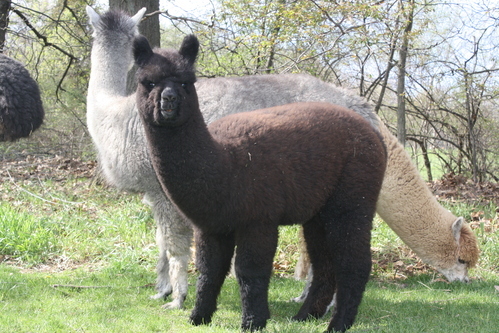 We are expecting a beautiful cria to join our herd.